There's not a more coveted autograph in all of sports than that of Babe Ruth. So when it comes to college football, particularly Ohio State, there's not a bigger name than 'Chic' Harley, the Babe Ruth of the Buckeyes. 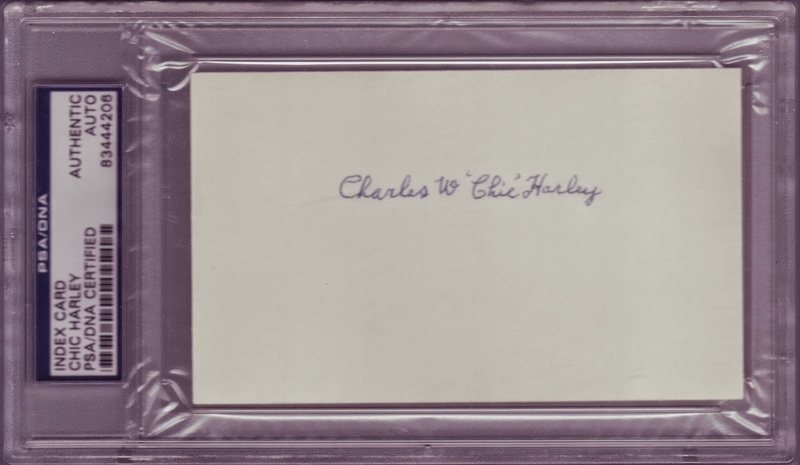 Harley put Ohio State football on the national map and that's why every Ohio State collection is not complete without an autograph of OSU's first three-time All-American. Charles William Harley was born on September 15, 1894, in Chicago, Illinois. At the age of 12, his family moved to Columbus, Ohio, and he received the nickname 'Chic', short for Chicago. He attended East High School and prior to his senior year, his parents were set for a move back to the Windy City. East principal John Harlor stepped in and asked Harley's father to allow Chic to stay and finish out high school in Columbus. Mr. Harley obliged and Chic would stay with the Vorys family for his senior year. John M. Vorys was a classmate and the captain of the East High football team. Harley and East tasted their only defeat in the season finale, 14-0, to Columbus North at Ohio Field, a place Ohio State football called home in those days. Harley was recruited to Ohio State by the Phi Gamma Delta fraternity, turning down offers to play at powerhouses Michigan, Notre Dame, and Chicago. After playing on the freshmen team in 1915, he had a breakout year in 1916. The Buckeyes started out 3-0 including a school-record 128-0 win over Oberlin. They upset Illinois 7-6 with a late comeback in which Harley improvised the winning score and booted through the game-winning extra point. Wisconsin came to town in the fourth game with both teams undefeated and clinging to hopes of a Western Conference Championship. After falling behind 7-0, Harley made a 27-yard run and kicked the extra point to tie the score. In the fourth quarter, Harley made an electrifying 80-yard punt return for the go-ahead touchdown. His extra point was converted and proved to be the difference after Wisconsin's attempt for the game-tying extra point in the final minutes failed. They won their next two against Indiana (46-7) and at Case (28-0) to setup a showdown between 6-0 Ohio State and 6-0 Northwestern for the title. After sitting out the first half, Chic Harley exploded for 20 second half points to lift Ohio State to a 23-3 win over the Wildcats and their first ever Western Conference championship. Following the season, Ohio State's sophomore sensation was selected to the exclusive Walter Camp All-American list. Prior to the 1917 season, Chic Harley announced that he would enter the Aviation Corps. to fight the ongoing World War I. While waiting to be accepted to the Air Force, Harley played his junior season. Ohio State outscored their opponents 292-6 on the year, tying Auburn 0-0 to finish 8-0-1. They repeated as Western Conference champs and Harley repeated as a First Team All-American selection. After flight training in San Antonio, Texas, and a year and a half of service, Harley returned to Columbus in July of 1919. While he was away, Michigan made a return to the Western Conference after leaving more than a decade prior in 1908. Ohio State began the 1919 season by outscoring Ohio Wesleyan, Cincinnati, and Kentucky by a total score of 133-0. The Buckeyes had high hopes when they traveled to Ferry Field in Ann Arbor, looking for their first ever win against the University of Michigan. Harley intercepted a couple of passes on defense and made a jaw-dropping 42-yard touchdown run, breaking three tackles on his way to the end zone. The 13-3 win was the first in what would become one of college football's greatest rivalries. Following the game, legendary Michigan head coach Fielding H. Yost asked for and was granted a rare moment to address the Ohio State team. "You deserve your victory, you fought brilliantly. You boys gave a grand exhibition of football strategy and while I am sorry, dreadfully sorry, that we lost, I want to congratulate you. And you, Mr. Harley, I believe, are one of the finest little machines I have ever seen." Ohio State would follow up their big win with shutouts over Purdue (20-0) and at Wisconsin (3-0) to face Illinois for the conference title. However, Harley was not at full strength, coming in with a banged up knee. He did score Ohio State's only touchdown on a 1-yard plunge to give Ohio State a 7-6 lead in the third quarter. 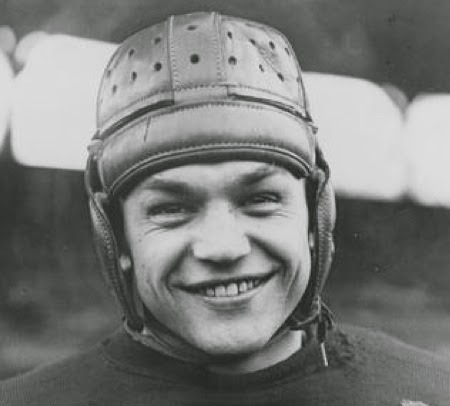 With eight seconds remaining in the game, however, Illinois' Bob Fletcher connected successfully on his first ever field goal attempt to hand Harley and his Buckeyes a 9-7 defeat. Chic Harley stood on the field sobbing and had to be helped to the locker room following his only collegiate loss. A win would have likely given Ohio State their first ever National Championship, instead unbeaten Harvard was crowned champions. In spite of the loss, Harley was named for a third time to Walter Camp's First Team All-America list. He scored 23 touchdowns, converted 39 extra points, and booted eight field goals in his three years of varsity. He was the first three-time All-American at Ohio State and he was responsible for generating a euphoria among the Buckeye rooters. It led to the opening of the cathedral that is now often referred to as "The Horseshoe" or properly Ohio Stadium. It has also been appropriately called, "The House That Harley Built" for the impact and joy he brought towards football in Columbus. At 5-9, 150-pounds, Chic would have likely been the school's first ever Heisman winner had there been such an award then. No better testament than from the man whom the award bears his name. In a 1928 column from King Features Syndicate, John W. Heisman said, "It's not too much to say that if one player ever pulled a football aggregation on its feet and put his college into a place in the sun, that player was Chic Harley." In 1941, James Thurber, who also attended East High School, wrote in the New York newspaper PM, "If you never saw (Chic Harley) run with a football, we can't describe it to you. It wasn't like Jim Thorpe or Red Grange or Tom Harmon or anybody else. It was a kind of a cross between music and cannon fire, and it brought your heart up under your ears." Because of several head injuries throughout his life, Harley's mental health declined rapidly in the 1920's, ending his professional career after one season with the Decatur Staleys. He was diagnosed with early dementia. In 1938, he was admitted to the Veterans Hospital in Danville, Illinois, where he'd live the rest of his life. In 1948, after a series of insulin injections, Chic regained enough mental stability to travel outside the facility and live somewhat a normal life. That included attending Ohio State games throughout his final years. When word spread that he would be attending the Ohio State-Michigan game in 1948, more than 75,000 people lined up at the train station to welcome home Harley in the form of a ticker-tape parade. The Marching Band also gave a touching tribute, opening up the right side of the o's in their famous "Script Ohio" to spell out "Chic", the only time the formation has ever been altered. A few years later, he was one of 44 charter members inducted into the inaugural 1951 College Football Hall of Fame class. On April 21, 1974, Chic Harley got sick and passed away at the age of 79 from bronchial pneumonia. Members of the 1974 Ohio State team, Archie Griffin, Pete Cusick, Neal Colzie, Steve Myers, and Kurt Schumacher served as pallbearers. On October 30, 2004, Ohio State retired Chic Harley's #47 jersey number, the last number he wore at Ohio State. It was long overdue. After all, we're talking about the Babe Ruth of Ohio State football. Small in stature, but a larger than life figure that inspired and continues to inspire, even decades after his death, an unmatched enthusiasm about football at Ohio State. I am shocked that no one has posted on this - Chic Harley was magic. He, and his teammates, changed the course of Ohio State football history. They went from an average college team to a contender and a school that when often thought of people thing of the football team before academic prowess. Charles William "Chic" Harley - will forever be remembered - we are a better world because of his play, his persona, his character, and his modesty. We could all learn from that.